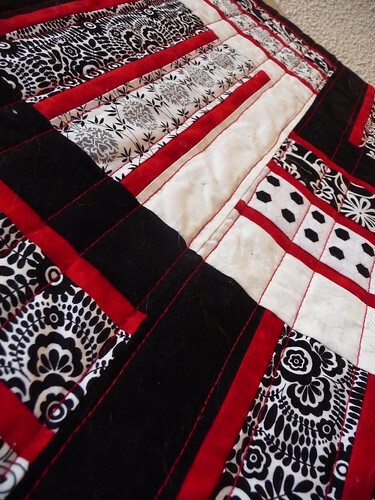 Domestic Moose: So what is wrong with this quilt? Why do I prefer looking at the back instead of the front? Maybe it's because the friend this is going to requested tan after I'd made up the front so this is meant to be reversible. Which worked out well, I think it's absolutely reversible and I totally prefer the back. I can look at this one in pictures and think it looks great, if a little blurry. Apparently my camera had a fingerprint on the lens so it wouldn't focus properly. But I've hated working on it for awhile now. In fact, that back? 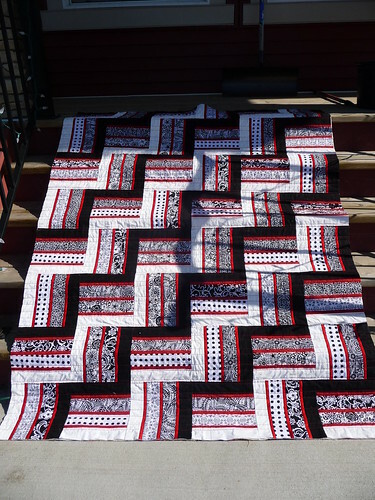 The red and black bits were meant to be the border for the front until I decided I was done with this quilt and just wanted to finish it. So I sewed them together in strips, added some color blocking to the outside and called it the backing. Now here's the thing. This is the first quilt I'll give away. 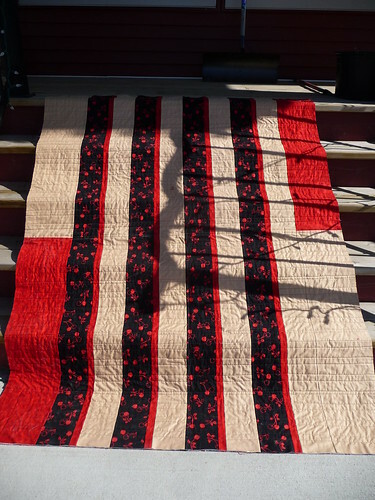 I had others that I'd planned to give away, but when I'd finished quilting them, I was unhappy. My biggest problem has been puckers in the back. Big, giant puckers. And the straight line quilting turned out pretty good, even if I did dread every minute of it. After my last few attempts at quilting previous quilts, I decided to spend some time investigating my problems with the quilting. What I was doing wrong? I narrowed it down to two things. First, my back wasn't taut enough. I worried about stretching the fabric and didn't smooth it as much as I should have. 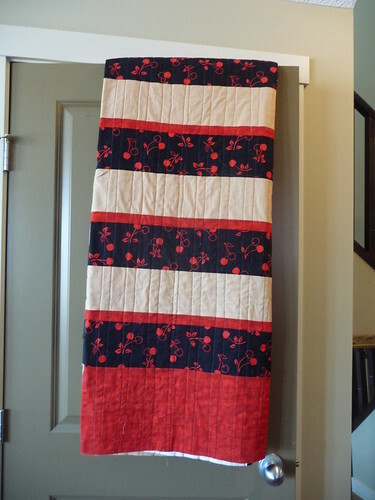 I also pinned the living crap out of this quilt - which may account for some of the dislike. That was a lot of time spent laying on a hardwood floor, fighting with safety pins. So much that my husband suggested next time we'd try spray basting. So, I've learned how to layer and baste and I've played a bit with a more interesting pieced back. I may not like working on this quilt right now, but I do like what I've learned from it. Maybe I whined just a little too much. In other news, this quilt and I have a date with a seam ripper. I love the prints in this beyond all reason and it's time they got used for something other than a quilt both my husband and I don't like. Sometimes you just have to accept that it isn't going to work and you need to go back to the drawing board. Those owls are still awesome. I agree with you that I prefer the back to the front! It's great that you learnt a lot from making it. It is absolutely reversible, and I actually like the back too! 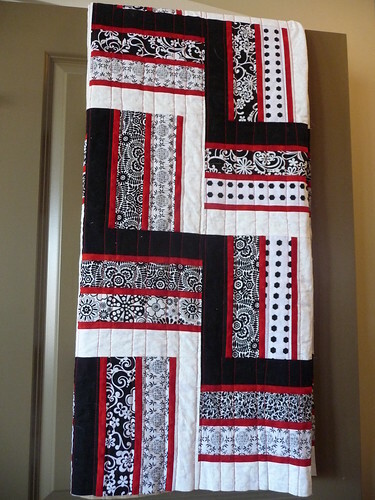 I am so happy for you that the quilting worked out better this time! Are you using a walking foot? I gave up pinning and went to spray basting last year, and love, love it! 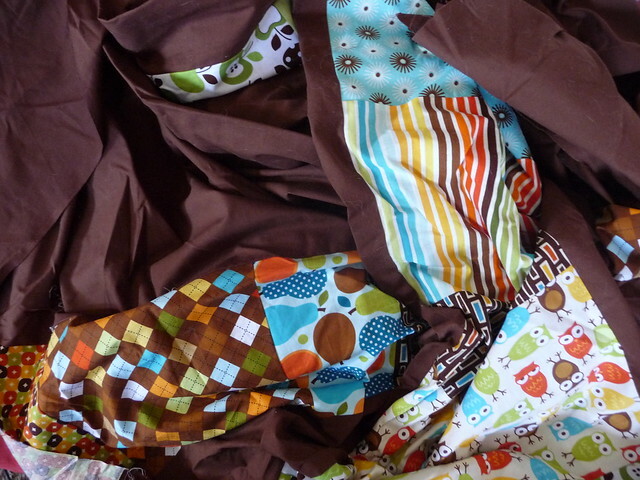 I don't think I would ever go back to pins, although I did have to pin a quilt with a voile backing! Your quilt turned out beautiful, even if you don't like it. I hope your friend LOVES it though! To get my quilt back taut, I straight-pin it to the carpet, putting pins across from each and gently pulling it all smooth. For pin basting, I read about a tool like this one ( http://www.amazon.com/Kwik-Klips-Basting-Quilt-Layers/dp/B0016IZIJI ) and decided to make my own. It really saves your fingers and finger nails!! I've never tried spray basting. First off: you made me laugh and then want to take an Advil for you! Secondly: I love both sides! I tape my back to the floor usually and iron the heck out of it. 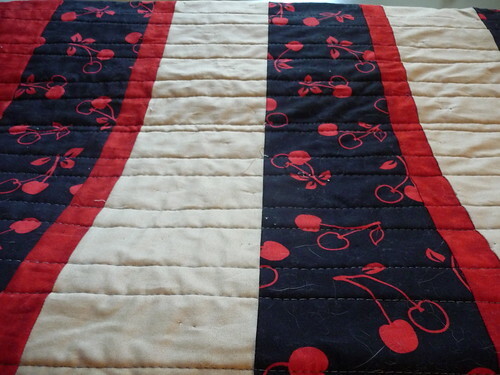 That works really well for me:) This last time though the quilt was too big for hardwood floor area and so I had to use pushpins for the backing.